It's becoming increasingly difficult to go back to old Hanoi. The horizon is visible in only very few places as the move up to the sky continues. On clear days across West Lake, I used to be able to see unobscured views of the hills, Ba Vi and Tam Dao. Now, residential and commercial high rises impede the view. Pagodas and temples are getting make-overs which leave them the same drab grey of other new structures. Bicycles are being pushed about in the heave of traffic on roads they once dominated. The girls are having their gorgeous long hair clipped short and coloured, the boys are growing theirs long and choosing funky frames for their glasses. KFC, Lotteria, Burberry, ATMs galore, mad technology uptake. My students have Ipads. And the cars. My God, the cars. But there is such an excitement about the newness, about being able to afford posessions, about accumulating possessions, about shopping for shoes, about Hanoi getting tall buildings and posh shops and malls, about buying shares, smoking foreign cigarettes, designing the home renovations, choosing the paint scheme and the furniture, owning a family pet. For the most part, I'm enjoying the ride. After decades of misery and bombs and death and poverty and decay, allow the Vietnamese some time in the sun, I say. And inversely, allow me to go in search of crumbling Hanoi, broken pottery, old boys playing chess and street vendors peddling snails. Twenty years ago, when Vietnam was still somewhat in the doldrums, this snail vendor started passing by Hanoi's Truc Bach village, just north of the Old Quarter. Each afternoon, she sets up her two-basket operation in a tiny alley where the only through-traffic is to one or two homes that lie at its end. She hangs a nondescript sign, signalling that all is in readiness. 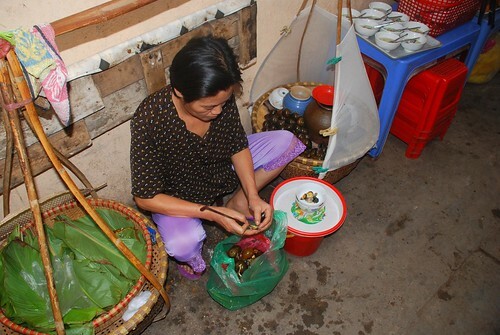 In one basket, on a bed of banana leaves, the vendor handles the sticky fresh white noodles known as bun, which are the carb element of this dish. Mounded on plastic plates, they arrive first at the table as the vendor takes to the snails with a tool that wouldn't be out of place in a surgeon's sterilised instrument tray. Designed for removing slippery things in awkward places, it is a thin metal rod with a sharp angled hook that she expertly slides into the snail shell before sharply wrenching the little blighters out. The other basket contains the creatures: freshwater gastropods with ornate spiral shells, surely a design wonder of the animal world. Much prettier than what emerges from them, that's for sure. In little white bowls, post-op, they look like something an elephant might have sneezed up. The sooner they're covered, the better. 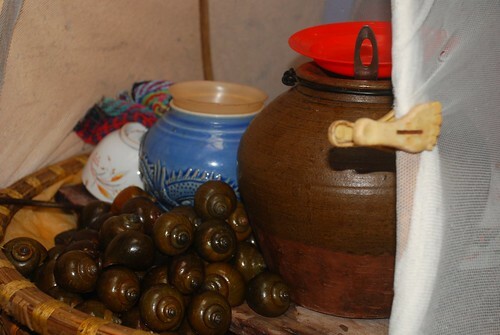 Out of old-world stoneware, the vendor spoons out the tomato-based broth the snails have been cooked in. 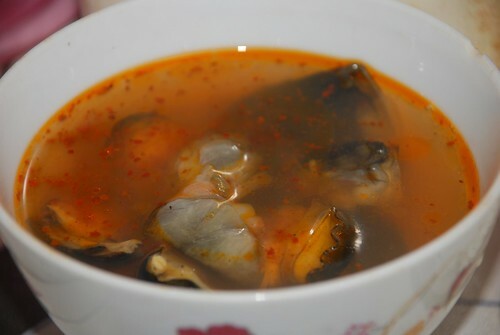 Chili paste is added to the soup at the table and the noodles are wetted before they are eaten. And the snails? Without going into anatomical detail, parts of them are quite silky and sensuous. Other parts are much as you would expect, kind of chewy, bouncing in the mouth. When I have them where I want them, all that is left is a half bowl of broth. 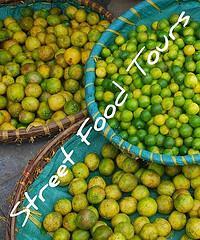 The vendor taps me on the shoulder and smiles, gently miming that I should put the bowl to my lips and drink it down. And I do. The soup and the experience. The moment back in time. I was getting worried for this post until you said you were enjoying the ride. I do too. I think change in Hanoi is at least as interesting as what proceeded it. There are times when it feels like Old Hanoi is being actively stifled - when you read of old ladies carrying baskets being banned it makes no sense at all. But I suppose that is the same as all countries - they don't know what they've got till it's gone. Snails...yum, however, now I'll have the image of a snotty elephant in my mind next time I'm lucky enough to eat them. THANKS A LOT!!!!! Seriously, great photos and so called progress is inevitable no matter where you are, shame. Ohhhhhh must try these!!! Thank you for this post!! I haven't had snails in a long time. Thank you for posting this; it sure brought back a lot of memories. Steve - not much we can do about it other than savour and document what's left. Bridget Davis and LeTran - my pleasure. Hope you get to try them BD and again LT.